For regional-influenced varieties of Italian, see Regional Italian. Communities recognized by Italy as historical language minorities. The Republic safeguards linguistic minorities by means of appropriate measures. The Art. 6 of the Italian Constitution was drafted by the Founding Fathers to show sympathy for the country's historical linguistic minorities, in a way for the newly-founded Republic to let them become part of the national fabric and distance itself from the Italianization policies promoted earlier because of nationalism, especially during Fascism. However, more than a half century passed before the Art. 6 was followed by any of the above-mentioned "appropriate measures". Italy applied in fact the Article for the first time in 1999, by means of the national law N.482/99. Before said legal framework entered into force, only four linguistic minorities (the French-speaking community in the Aosta Valley; the German-speaking community and, to a limited extent, the Ladin one in the Province of Bolzano; the Slovene-speaking community in the Province of Trieste and, with less rights, the Province of Gorizia) enjoyed some kind of acknowledgment and protection, stemming from specific clauses within international treaties. The other eight linguistic minorities were to be recognized only in 1999, including the Slovene-speaking minority in the Province of Udine and the Germanic populations (Walser, Mocheni and Cimbri) residing in provinces different from Bolzano. Some now-recognized minority groups, namely in Friuli-Venezia Giulia and Sardinia, already provided themselves with regional laws of their own. It has been estimated that less than 400.000 people, out of the two million people belonging to the twelve historical minorities (with Sardinian being the numerically biggest one), enjoyed state-wide protection. Around the 1960s, the Italian Parliament eventually resolved to apply the previously neglected article of the country's fundamental Charter. The Parliament thus appointed a "Committee of three Sages" to single out the groups that were to be recognized as linguistic minorities, and further elaborate the reason for their inclusion. The nominated people were Tullio de Mauro, Giovan Battista Pellegrini and Alessandro Pizzorusso, three notable figures who distinguished themselves with their life-long activity of research in the field of both linguistics and legal theory. Based on linguistic, historical as well as anthropological considerations, the experts eventually selected thirteen groups, corresponding to the currently recognized twelve with the further addition of the Sinti and Romani-speaking populations. The original list was approved, with the only exception of the nomadic peoples, who lacked the territoriality requisite and therefore needed a separate law. However, the draft was presented to the law-making bodies when the legislature was about to run its course, and had to be passed another time. The bill was met with resistance by all the subsequent legislatures, being reluctant to challenge the widely-held myth of "Italian linguistic homogeneity", and only in 1999 did it eventually pass, becoming a law. In the end, the historical language minorities were thus recognized by the Law no. 482/1999: Albanian, Catalan, German, Greek, Slovene, Croatian, French, Franco-Provençal, Friulian, Ladin, Occitan and Sardinian (Legge 15 Dicembre 1999, n. 482, Art. 2, comma 1). Some interpretations of said law seem to divide the twelve languages into two groups, with the first including the non-Latin speaking populations (with the exception of the Catalan-speaking one) and the second including only the Romance-speaking populations. Some other interpretations state that a further distinction is implied, considering only some groups to be national minorities. Regardless of the ambiguous phrasing, all the twelve groups are technically supposed to be allowed the same measures of protection; furthermore, the Framework Convention for the Protection of National Minorities, signed and ratified by Italy in 1997, applies to all the twelve groups mentioned by the 1999 national law, therefore including the Friulians, the Sardinians, the Occitans, the Ladins etc., with the addition of the Romani. In actual practice, not each of the twelve historical language minorities is given the same consideration. In fact, the discrimination lies in the urgent need to award the highest degree of protection only to the French-speaking minority in the Aosta Valley and the German one in South Tyrol, owing to international treaties. For example, the institutional websites are only in Italian with a few exceptions, like a French version of the Italian Chamber of Deputies. A bill proposed by former prime minister Mario Monti's cabinet formally introduced a differential treatment between the twelve historical language minorities, distinguishing between those with a "foreign mother tongue" (the groups protected by agreements with Austria, France and Slovenia) and those with a "peculiar dialect" (all the others). The bill was later implemented, but deemed unconstitutional by the Constitutional Court. The selection of the twelve recognized languages to the exclusion of others is a matter of some controversy. Daniele Bonamore argues that many regional languages were not given recognition in light of their historical participation in the construction of the Italian language: Giacomo da Lentini's and Cielo d'Alcamo's Sicilian, Guido Guinizelli's Bolognese, Jacopone da Todi's Umbrian, Neapolitan, Carlo Goldoni's Venetian and Dante's Tuscan are considered to be historical founders of the Italian linguistic majority; outside of such epicenter are, on the other hand, Friulian, Ladin, Sardinian, Franco-Provençal and Occitan, which are recognized as distinct languages. Michele Salazar found Bonamore's explanation "new and convincing". Italy is a signatory of the European Charter for Regional or Minority Languages, but has not ratified the treaty, and therefore its provisions protecting regional languages do not apply in the country. The Charter does not, however, establish at what point differences in expression result in a separate language, deeming it an "often controversial issue", and citing the necessity to take into account, other than purely linguistic criteria, also "psychological, sociological and political considerations". German is unofficial but recognised in the Lys Valley (Lystal) (Le Statut spécial de la Vallée d'Aoste, Title VIe, Art. 40 - bis). Griko, Arbëresh and Franco-Provençal are recognized and safeguarded (Legge regionale 5/2012). Friulian and Slovene are "promoted", but not recognised, by the region (Legge regionale 18 dicembre 2007, n. 29, Art. 1, comma 1); (Legge regionale 16 novembre 2007, n. 26, Art. 16). Lombard is unofficial but recognised as the regional language (Legge regionale 25/2016). the region "promotes", without recognising, the Occitan, Franco-Provençal, French and Walser languages (Legge regionale 7 aprile 2009, n. 11, Art. 1). The region considers the cultural identity of the Sardinian people as a primary asset (l.r. N.26/97, l.r. N.22/18), in accordance with the values of equality and linguistic pluralism enshrined in the Italian Constitution and the European treaties, with particular reference to the European Charter for Regional or Minority Languages and the Framework Convention for the Protection of National Minorities (l.r. N.26/97). All the languages indigenous to the island (Sardinian, Catalan, Tabarchino, Sassarese and Gallurese) are recognised and promoted as "enjoying the same dignity and standing of Italian" (l.r. N.26/97) in their respective linguistic areas. Sicilian is unofficial but recognised as the regional language (Legge regionale 9/2011). Ladin, Cimbrian and Mòcheno are unofficial but recognised in (Statuto speciale per il Trentino-Alto Adige, Titolo XI, Articolo 102). Venetian is unofficial but recognised (Legge regionale 13 aprile 2007, n. 8, Art. 2, comma 2). Frequency of use of regional languages in Italy, based on ISTAT data from 2015. According to the UNESCO's Atlas of the World's Languages in Danger, there are 31 endangered languages in Italy. The degree of endangerment is classified in different categories ranging from 'safe' (safe languages are not included in the atlas) to 'extinct' (when there are no speakers left). The source for the languages' distribution is the Atlas of the World's Languages in Danger unless otherwise stated, and refers to Italy exclusively. Griko (Calabria): a few villages near Reggio di Calabria in southern Calabria; an outlying dialect of Greek not listed separately by the SIL. All living languages indigenous to Italy are part of the Indo-European language family. The source is the SIL's Ethnologue unless otherwise stated. Language classification can be a controversial issue, when a classification is contested by academic sources, this is reported in the 'notes' column. They can be divided into Romance languages and non-Romance languages. Not included is Corsican, which is mainly spoken on the French island of Corsica. Istriot is only spoken in Croatia. Judeo-Italian is moribund. Sardinian is a distinct language with significant phonological differences among its own varieties. Ethnologue, not without controversy, even goes as far as considering Sardinian to be a macrolanguage with four separate languages of its own, all being included along with the Corsican varieties in a specific subgroup of the Romance languages, named Southern Romance: this particular classification has gained little support from linguists. Some other linguists, like Heinrich Lausberg, proposed to consider Sardinian as the sole living representative of the above mentioned linguistic family, which used to comprise even the now extinct Afro-Romance dialects as well as the Corsican dialects before they underwent Tuscanization. UNESCO, while seeming to share the same opinion of Ethnologue by calling Gallurese and Sassarese "Sardinian", considers them to be originally dialects of Corsican rather than Sardinian on the other hand. As is not infrequently the case in such controversies, the linguistic landscape of Sardinia is in principle most accurately described as being, for the most part, a dialect continuum. The Northern Italian languages are conventionally defined as those Romance languages spoken north of the La Spezia–Rimini Line, which runs through the northern Apennine Mountains just to the north of Tuscany; however, the dialects of Occitan and Franco-Provençal spoken in the extreme northwest of Italy (e.g. 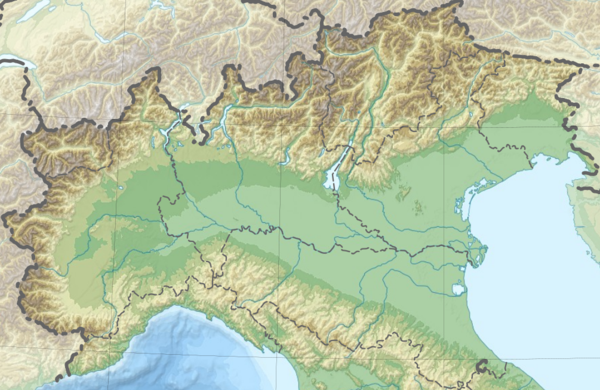 the Valdôtain in the Aosta Valley) are generally excluded. The classification of these languages is difficult and not agreed-upon, due both to the variations among the languages and to the fact that they share isoglosses of various sorts with both the Italo-Romance languages to the south and the Gallo-Romance languages to the northwest. The Italian Rhaeto-Romance languages, including Ladin and Friulan. The poorly researched Istriot language. The Venetian language (sometimes grouped with the majority Gallo-Italian languages). The Gallo-Italian languages, including all the rest (although with some doubt regarding the position of Ligurian). Any such classification runs into the basic problem that there is a dialect continuum throughout northern Italy, with a continuous transition of spoken dialects between e.g. Venetian and Ladin, or Venetian and Emilio-Romagnolo (usually considered Gallo-Italian). All of these languages are considered innovative relative to the Romance languages as a whole, with some of the Gallo-Italian languages having phonological changes nearly as extreme as standard French (usually considered the most phonologically innovative of the Romance languages). This distinguishes them significantly from standard Italian, which is extremely conservative in its phonology (and notably conservative in its morphology). The Italo-Dalmatian languages, including Neapolitan and Sicilian, as well as the Sardinian-influenced Sassarese and Gallurese which are sometimes grouped with Sardinian but are actually of southern Corsican origin. The Sardinian language, usually listed as a group of its own with two main Logudorese and Campidanese ortographic forms. All of these languages are considered conservative relative to the Romance languages as a whole, with Sardinian being the most conservative of them all. Venetian: "Grafia Veneta Unitaria", official manual from Regione Veneto local government published in 1995, although written in Italian. ^ Tagliavini, Carlo (1962). Le origini delle lingue neolatine: introduzione alla filologia romanza. R. Patròn. ^ "La variazione diatopica". Archived from the original on February 2012. ^ "Italy". Ethnologue. Retrieved 22 July 2017. ^ Loporcaro 2009; Marcato 2007; Posner 1996; Repetti 2000:1–2; Cravens 2014. ^ Maiden, Martin; Parry, Mair (7 March 2006). The Dialects of Italy. Routledge. p. 2. ^ Repetti, Lori (2000). Phonological Theory and the Dialects of Italy. John Benjamins Publishing. Retrieved 3 November 2015. ^ "Legge 482". Camera.it. Retrieved 17 October 2015. ^ "Legge 482". Webcitation.org. Archived from the original on 9 October 2015. Retrieved 17 October 2015. ^ "Lingue di Minoranza e Scuola: Carta Generale". Minoranze-linguistiche-scuola.it. Retrieved 8 October 2017. ^ a b "Tutela delle minoranze linguistiche e articolo 6 Costituzione". ^ "Articolo 6 Costituzione, Dispositivo e Spiegazione". ^ a b c d "Schiavi Fachin, Silvana. Articolo 6, Lingue da tutelare". ^ "Lingue di Minoranza e Scuola, Sardo". ^ "Inchiesta ISTAT 2000, pg.105-107" (PDF). ^ "What Languages are Spoken in Italy?". ^ "Italy's general legislation, Language Laws". ^ "Lingua Sarda, Legislazione Internazionale, Sardegna Cultura". ^ "Coordinamentu sardu ufitziale, lettera a Consiglio d'Europa: "Rispettare impegni"". ^ "Il Consiglio d'Europa: «Lingua sarda discriminata, norme non rispettate»". ^ See the appeal of the attorney Felice Besostri against the Italian electoral law of 2015. ^ "Sentenza Corte costituzionale nr. 215 del 3 luglio 2013, depositata il 18 luglio 2013 su ricorso della regione Friuli-VG". ^ "Anche per la Consulta i friulani non sono una minoranza di serie B" (PDF). ^ "Chart of signatures and ratifications of Treaty 148". Council of Europe. Archived from the original on 17 October 2015. Retrieved 17 October 2015. ^ Puglia, QUIregione - Il Sito web Istituzionale della Regione. "QUIregione - Il Sito web Istituzionale della Regione Puglia". QUIregione - Il Sito web Istituzionale della Regione Puglia. Retrieved 10 June 2018. ^ a b c "Legge Regionale 15 ottobre 1997, n. 26". Regione autonoma della Sardegna – Regione Autònoma de Sardigna. ^ "Legge Regionale 3 Luglio 2018, n. 22". Regione autonoma della Sardegna – Regione Autònoma de Sardigna. ^ "Endangered languages in Europe: report". Helsinki.fi. Retrieved 17 October 2015. ^ "Sociolinguistic Condition". Arlef.it. Retrieved 8 October 2017. ^ "Ethnologue report for Southern Romance". Ethnologue.com. Retrieved 17 October 2015. ^ Hull, Geoffrey, PhD thesis 1982 (University of Sydney), published as The Linguistic Unity of Northern Italy and Rhaetia: Historical Grammar of the Padanian Language. 2 vols. Sydney: Beta Crucis, 2017. ^ "Linguistic diversity among foreign citizens in Italy". Statistics of Italy. 25 July 2014. Retrieved 1 April 2015. ^ "Stranieri residenti e condizioni di vita : Lingua madre". Istat.it. Retrieved 30 July 2018. Loporcaro, Michele (2009). Profilo linguistico dei dialetti italiani (in Italian). Bari: Laterza. Cravens, Thomas D. (2014). "Italia Linguistica and the European Charter for Regional or Minority Languages". Forum Italicum. 48. pp. 202–218. Marcato, Carla (2007). Dialetto, dialetti e italiano (in Italian). Bologna: Il Mulino. Posner, Rebecca (1996). The Romance languages. Cambridge: Cambridge University Press. Rapetti, Lori, ed. (2000). Phonological theory and the dialects of Italy. Amsterdam Studies in the Theory and History of Linguistic Science, Series IV Current Issues in Linguistic Theory. 212. Amsterdam/Philadelphia: John Benjamins Publishing. This page was last edited on 7 April 2019, at 05:57 (UTC).